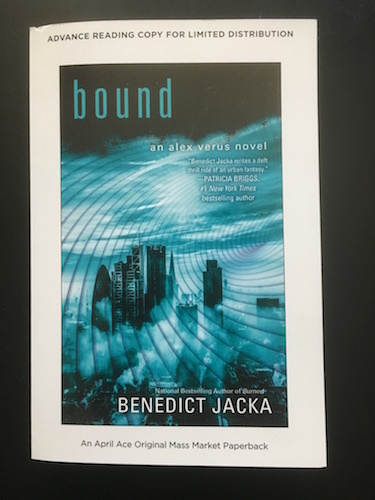 The first paper copies of Bound are arriving. They’re just for me (you guys don’t get to pick them up just yet) but here’s a picture so you can see what they look like! This isn’t how the finished versions will look (they’ll be missing the white border) but I kind of like this design, too. Bound will be out in the US and UK at the beginning of April, 2017. Why is this going to take another FIVE MONTHS? That is really somewhat annoying. Also, in the past, the Audible version has taken substantially longer to become available than the printed version, at least for Audible.com customers who live outside the US. I live in Manila, and for at least one of your books – the last one, I think – I was at first unable to buy it on Audible.com due to “licensing restrictions”. It became available later, and I bought it, but others would probably just go ahead and pirate it if you don’t want to sell it to them. Google ‘The Process’ on my site if you want an explanation of wait times. I wrote a series of posts about it. Short version: it’s up to my publishers and I have very limited influence over release dates. You might try to pressure your publisher to make sure that the audible.com audiobook becomes available internationally on the same day as it becomes available in the US. This is the case for almost all audible.com audiobooks; I don’t think there’s a good reason why your books should be an exception. And a delay in international availability costs you sales.